AVRphone « Adafruit Industries – Makers, hackers, artists, designers and engineers! 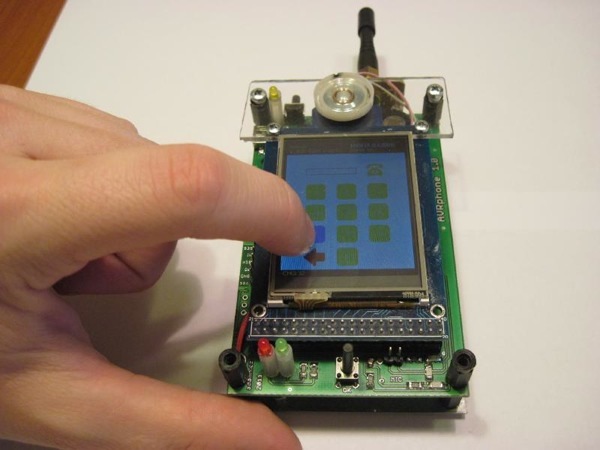 AvrPhone is a simple mobile phone with a touchscreen. His brain is AVR microcontroller ATmega128 (128 kB flash, 4 kB SRAM) and user interface provides 2.4 “LCD display with touch foil and controller ILI9325B , equipped with 16-bit bus. The communication module provides GSM SIM100S čísnkého manufacturer Simcoe. The whole system is powered by a 3.7 V/1000 mAh Li-Pol cells.